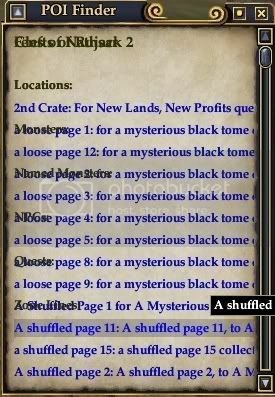 I love your mod, but as I am a roleplayer, and really do read the books for lore and to be in character, it is almost impossible to read in game books with the skin for the window that is used for reading any books in game. Is there a way to change the background just for that window so I may be able to read books, and see the illustrations better? You can consider this mod to be retired as of the launch of the new EQ2Maping mod (1.1.1+) since it includes all the functionality of the POI Finder and more. I have no plans to update it further or make it compatible with the new EQ2Map. I keep forgetting to take screen's but essentially these are just as good to demonstrate. After unlocking the horizontal it was like this. Rt3: If you could, please tell me what resolution you play the game in, and if in a full screen or windowed mode. Also if possible, take a screenshot or 2 of how things looked before you changed the xml and post a link to it here. There could be some confusion as to what you are talking about and what i'm referring too. Possibly different resolutions, 4:3 compared to wide screen make the horizontal hard set width not good for some. Basically my situation was very similar to this. Hard set i would see. "The boy ran up th"
"The boy ran up the hill and fetched a pale of water." If i was looking for "pale", i was better off methodically going through all the dots on the map. This addon became very limited in its usefulness. Unlocking it would be helpful to allot of people. I keep hearing the text is fixed length but trust me i see much longer strings of text on different maps, for example Timorous Deep is all short and that fixed width is fine, however in Fens of Nathsar i can widen the screen way out and the text just keeps on displaying, which is EXTREMELY helpful due to the way people input tips into POI. This is wery strage, as the buttons are limited to 250 in length, this should not be possible even if the button text was longer. The Tooltip has no limits in length and should diplay the complete discription. Last edited by jnils : 09-11-2008 at 10:18 AM. Unlock yours and go to different areas and you will see what i mean. Last edited by rt3 : 09-10-2008 at 11:05 AM. I had it with being locked horizontally. I think different resolutions, wide screen monitors possibly all play a part in the issue. 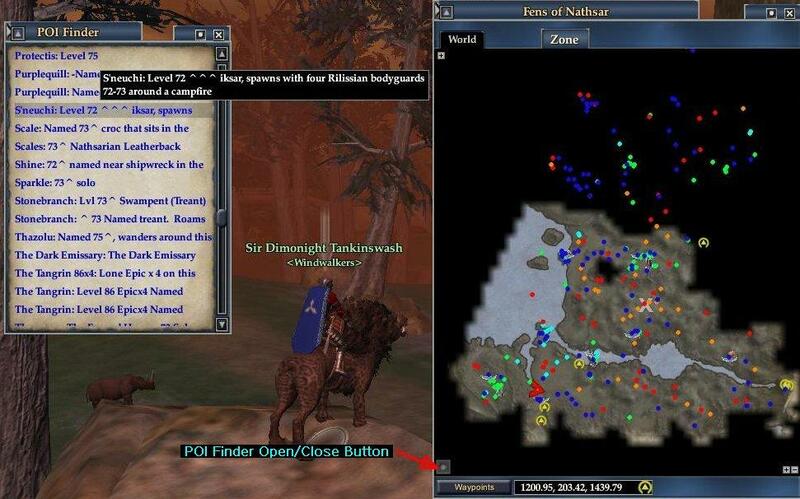 Open your "eq2ui_custom_poifinder.xml" with XML Notepad 2007 and on the left simply right click on the "MAXimumsize" and select to delete, save the file and voila you can size the window to suit your resolution or widescreen. Ahhhhh, now i can find things fast again. Since I can't claim to have a fantastic reason for keeping the width locked I may make it unlockable with my next update. Since the text was always the same max length I saw no reason to make it wider. But then I didn't realize that running at different resolutions might make a difference with how it looks. Last edited by rt3 : 09-07-2008 at 08:44 PM. It should be wide as the screenshot above. Nope, that was why i was posting. Looks like it happens to others as well. How so you unlock the horizontal? Thanks! But i think I'm going to leave well enough alone. It was just a little jarring at first to have it nice and wide like the screenshots then down to a thin little strip of text. 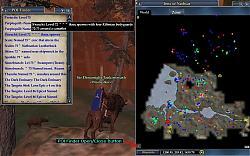 Great mod though, couldn't use EQ2 map without it. Last edited by jnils : 09-06-2008 at 03:07 AM. You can open "eq2ui_custom_poifinder.xml" and at MaximumSize="300,16384" change 300 to a bigger value. But as TreeMos version cap the buttons there is no point doing so. Last edited by rt3 : 09-05-2008 at 08:50 AM.